A meniscal repair is a surgical procedure to repair a torn meniscus via keyhole surgery. It is a minimally invasive procedure often undergone as an outpatient. Factors affecting success include tear age, location and pattern, age of the patient, as well as any associated injuries. The major meniscal functions are to distribute stress across the knee during weight bearing, provide shock absorption, serve as secondary joint stabilizers (in an anterior cruciate ligament deficient knee, menisci will serve as joint stabilizers  , provide articular cartilage nutrition and lubrication, facilitate joint gliding, prevent hyperextension, and protect the joint margins. During knee flexion, the femoral condyles glide posteriorly on the tibial plateau in conjunction with tibial internal rotation. The lateral meniscus undergoes twice the anteroposterior translation of the medial meniscus during knee flexion. This translation prevents the femur from contacting the posterior margin of the tibial plateau. The meniscus is divided into three zones: the red-red, the red-white and the white-white. 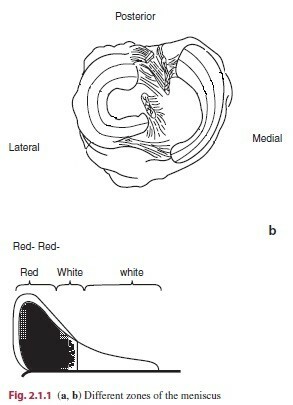 The zones are divided by vascularization and thus healing potential.The red-red zone is the peripheral zone of the meniscus. It is very good vascularized and has a good healing rate. Patients differ in vascularization of the medial and lateral meniscus, varying between 20-30 and 10-25 % width. The red-white zone is the middle third with less vascularization but can though heel sometimes. The white-white zone has no blood capillaries at all and therefore cannot heal. In general, meniscal tears frequently occur in middle-aged and elderly patients and are caused by long term degeneration. One third of the lesions by young patients are caused by sports-related injuries, because of the cutting or twisting movements, hyperextension or actions with great force. In more than 80%, meniscus tears are accompanied by anterior cruciate ligament (ACL) injury. Repair of a meniscal lesion should be strongly considered if the tear is peripheral and longitudinal, with concurrent Anterior Cruciate Ligament (ACL) reconstruction, and in younger patients. The probability of healing is decreased in complex or degenerative tears, central tears, and tears in unstable knees. Numerous repair techniques are available. Preservation of meniscal tissue is recommended, regardless of age - in active patients- whenever possible. Meniscal tears amenable to repair include unstable tears > 1 cm in length and occurring in the outer 20% to 30% toward the periphery, or in the so-called red-red zone. Those tears occurring more toward the junction of the red-white zone may also heal, and the decision to repair should be made based on the clinician's judgment. 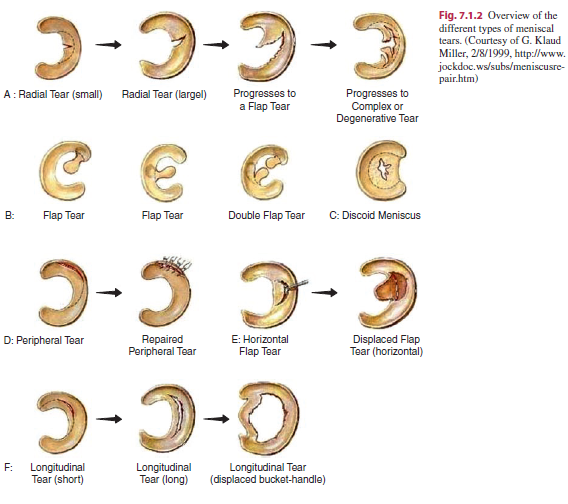 Ideal candidates for repair are vertical, longitudinal tears occurring within 3 mm of the peripheral rim. Tenuta JJ et al. also found that width of the lesion is an important factor no lesion with a width of more than 4 mm healed. Effusion may also occur when there are problems with the cruciate ligaments, bones or the articular cartilage. • Symptoms are frequently worsened by flexing and loading the knee, activities such as squatting and kneeling are poorly tolerated. But it’s the same with patients suffering from other pathologies like chondromalacia patellae, fractures and Sinding Larsen Johansson Syndrome. • Complaints of 'clicking', 'locking' and 'giving way' are common. Patients also complain about ‘giving’ way when there are suffering from anterior cruciate ligament injury. The feeling of instability and locking is also common with osteochondritis dessecans. Joint line tenderness and effusion. symptoms are frequently worsened by flexing and loading the knee, activities such as squatting and kneeling are poorly tolerated. When making a diagnosis, relevant patient history, physical examination, and appropriate imaging studies are required. Joint line tenderness has been reported to be the best common test for meniscal injury. McMurray's test positive if a pop or a snap at the joint line occurs while flexing and rotating the patient's knee. Apley's test performed with the patient prone, and with the examiner hyperflexing the knee and rotating the tibial plateau on the condyles. Steinman's test performed on a supine patient by bringing the knee into flexion and rotating. Ege's Test is performed with the patient squatting, an audible and palpable click is heard/felt over the area of the meniscus tear. The patient's feet are turned outwards to detect a medial meniscus tear, and turned inwards to detect a lateral meniscus tear. Patients undergoing con concomitant anterior cruciate ligament reconstruction enjoyed significantly improved outcomes of meniscal repair. (91%), while those with a past history of anterior cruciate ligament reconstruction had significantly worse meniscal repair success rate (63%). Bohnsack found a healing rate of 86-95%. The overall success rate for healing menisci with meniscal repair is high. In most of the studies they took a second MRI to confirm whether the lesion is healed. A patient is considered as being healed when there is no lesion on the second MRI and the patient is able to resume his normal life/activities. Locked bucket-handle, meniscal tears heal at a high rate when repaired as an isolated surgery; even when full weight bearing and activity before reconstruction is allowed and when the tear is in the white-on-white zone. Age or time between injury and surgery don’t affect the amount of people that were healed by meniscal repair. This technique offers the advantage of better preparation of the tear side. However, only the most peripheral of tears in the red-red zone are amenable to this technique and the main disadvantage of this technique is the risk of neural damage. Nowadays this technique isn’t frequently used anymore. Small  et al. studied the complications of 10,262 patients undergoing meniscal repair. Of the 10,262 patients 1,68% had complications. These complications were: Hemarthrosis, infection, thromboembolic disease, anesthetic complications, instrument failure, reflex sympathetic dystrophy, ligament injury, fracture and neurologic injuries. With hemarthrosis being the most common complication and neurologic injuries being least common. No vascular injuries were reported. And there was emphasized 7% incidence of saphenous neuropathy by Austin et al. It is also proven that neuromuscular electrical stimulation improves quadriceps muscle strength in subjects with Knee Osteoarthritis Most patients who choose for meniscal repair are operated within a short period of time, because of that there is seldom pre-operative physical therapy. But if a quick operative intervention is not possible for any reason, we assume that quadriceps training is also beneficial for patients undergoing meniscal repair. At long term the surgical repair of the meniscus gives a better result than a partial meniscectomy. But the revalidation is longer. (Level of Evidence: 4) This is something that the athlete must choose whether he wants to resume the sport quickly or not. There are 4 types of surgical repair: open, inside-out, outside-in and all-inside. For each operation they have to remove the loose parts, both surfaces of the tear should be sanded and the vascularity should be encouraged. The all-inside techniques are attractive because of the decrease in operative time and ease of the technique. Short-term results are positive for the all-inside technique; however, good long-term data on these techniques are lacking. The advantage of meniscectomy is that only the damaged tissue is removed. Important is that the circular collagen fibers may not be cut. (Level of Evidence: 2B) When that happens, the meniscus will lose his function as distributor of weight and then there is an increased risk of Osteoarthritis. A disadvantage of meniscectomy is that there is a prolonged conservative aftercare. There needs to be a period of maximum prognose to obtain the best possible healing. Exercise has been suggested to be an efficient treatment for patients with knee degeneration in order to improve knee function and limit joint pain. There is strong evidence that physical training plays an important role in order to reduce symptoms, improve muscle strength and physical ability. • progress weight bearing - weight bearing and joint stress are necessary to enhance the functionality of the meniscal repair so should be progressed as indicated by the consultant. Excessive shear forces may be disruptive and should be avoided initially. Physical exercise three times weekly during 4 months could lead to more than 35% improvement of knee function. Any rehabilitation program should be written on the patient’s body, every patient is different and will react differently to the rehabilitation. The results are for a large part depended on the speed and exactness of how the diagnosis is confirmed. The findings of many studies support weight-bearing limitations during the initial 4 to 8 weeks after meniscal repair.In theory, weight bearing alone should not disrupt healing meniscal tissue, because the hoop stresses are primarily absorbed at the periphery of the meniscus. However, weight bearing in conjunction with tibiofemoral rotation during knee flexion, could produce shear forces capable of disrupting healing meniscal tissue. Standard ‘cookbook’ protocols should be avoided and individualized programs - based on the type of surgical procedure, which meniscus was repaired, the presence of coexisting knee pathology (ligamentous laxity or OA), meniscal tear type, the patient’s age, preoperative kneestatus (including the time between injury and surgery), loss of ROM and strength, and the patient’s athletic expectations and motivations – should be encouraged. Accelerated meniscal repair rehabilitation programs that permit full knee ROM and full weight bearing are becoming more common, with return to full activity as early as 10 weeks after surgery. 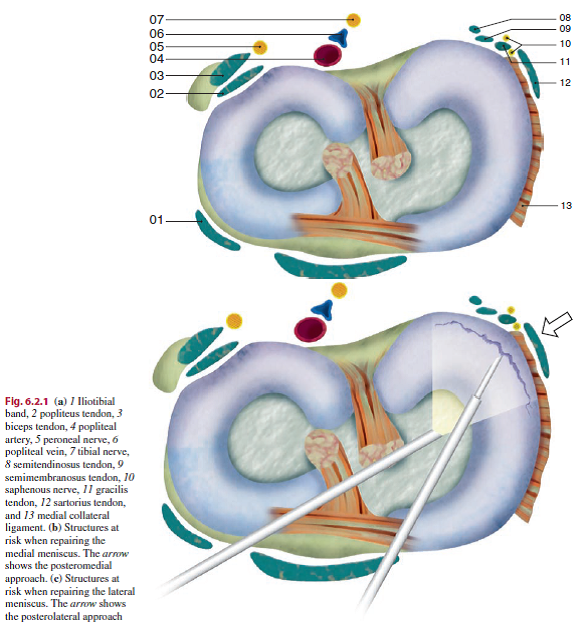 Timothy Brindle,John Nyland and Darren L. Johnson (2001) The Meniscus: Review of Basic Principles With Application to Surgery and Rehabilitation. Journal of Athletic Training, 36(2), 160–169. ↑ 2.0 2.1 2.2 2.3 2.4 2.5 2.6 Timothy Brindle,John Nyland and Darren L. Johnson (2001) The Meniscus: Review of Basic Principles With Application to Surgery and Rehabilitation. Journal of Athletic Training, 36(2), 160–169. ↑ 3.0 3.1 3.2 3.3 de Loës M., A 7-year study on risks and costs of knee injuries in male and female youth participants in 12 sports, Scandinavian Journal of Medicine & Science in Sports 2000: 10: 90-97. Level of evidence: 2A. ↑ 5.0 5.1 5.2 5.3 5.4 5.5 Poulsen MR, Johnson DL. Meniscal injuries in the young, athletically active patient. fckLRDepartment of Orthopaedic Sugery, University of Kentucky, Lexington, KY. Abstract. ↑ 6.0 6.1 6.2 6.3 6.4 Stärke C, Kopf S, Petersen W, Becker R. Meniscal repair. Arthroscopy. 2009 Sep;25(9):1033-44. Epub 2009 Feb 26. Abstract. ↑ 7.0 7.1 7.2 7.3 7.4 7.5 7.6 Heckmann TP, Barber-Westin SD, Noyes FR. Meniscal repair and transplantation: indications, techniques, rehabilitation, and clinical outcome. J Orthop Sports Phys Ther. 2006 Oct;36(10):795-814. Abstract. ↑ Trommel, M.F. Meniscal Repair, Thela-Thesis, Amsterdam,1999.